Pours nice reddish amber, dark copper very clear with a nice rich creamy but somewhat soapy head. Nicely carbonated with tiny bubbles rising up from the bottom of the glass. The head didn’t stick around very long but that’s pretty much expected for a lager. There are nice aromas coming from this beer. You can pick up some toasted caramel malts a nice hops. There is also some spice on the nose of this beer. It has a much better smell than the Sam Adams Octoberfest I had yesterday. That’s a nice Oktoberfest. It has a nice malt flavor, good carbonation for a fresh clean mouth feel and a very nice and unique finish. The finish is a nice combination of malt and spice and hops, very pleasant. This is an all-around nice Oktoberfest. The head I just about totally gone just a slight ring left on top around the edge of the glass. Wow, now at 68 degrees this beer is just as good as when I first poured it. It is not as refreshing; a little less carbonated but there is nothing offensive or unpleasant in the taste of this warm beer. What makes this even more impressive is that it’s a lager. 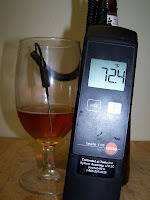 You can expect an ale to still taste good warm but it unusual to find a good tasting warm lager. I am very impressed with this beer. Not that it’s that phenomenal, but it was totally unexpected. I really did not expect Leinenkugel’s Oktoberfest to be this good. Even the last drop at 72 degrees was still a very good tasting beer. And Yes, (Missy), just incase you where wondering I really do use a digital thermometer. As we start a much anticipated fall beer season it’s a pleasant surprise to stumble on such a nice beer. This was a very satisfying Oktoberfest. I also just noticed that Leinenkugel calls this an Oktoberfest Marzen. I’m not sure if the mean that literally or if they mean Marzen in style. A real Oktoberfest Marzen is brewed in March and lagered (cold storage) until the fall. 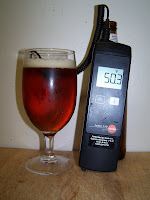 Well for a rating I have to go a little low, for an Oktoberfest Marzen a C+ Maybe even a B-. For a nice drinkable amber lager this would get and A. This is a very good beer but there are a lot better Oktoberfest Marzens out there. 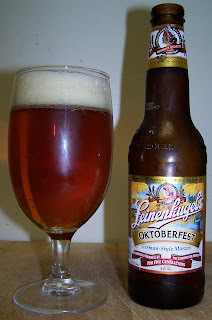 If you are looking for a good refreshing fall beer that has just a little bit more character than your typical lager try this Oktoberfest from Leinenkugel. It’s not the best Oktoberfest but it is a very pleasant and easy drinking beer. An excellent Amber Lager for sure. I tend to agree with your summary. When I first poured this beer, however, I didn't like it quite as much as when it had been in the glass for about 5-10 minutes. For me, once it warmed a little, it was more enjoyable. I'm not sure if I would go looking for this beer again until next fall. I think there are too many other good beers to try. But, maybe once a year as the leaves start to turn this wouldn't be a bad 6-pack.